I am taking a break from sorting through the unfinished projects in my closet to write this. 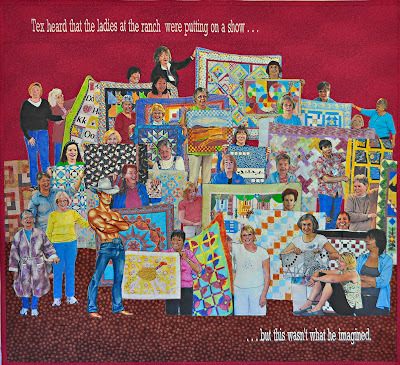 Tomorrow, I'll head off to my twice-yearly quilting retreat at the Bishop's Ranch where I'll be hanging out with many of the ladies pictured above. (And I'll be thinking of you and last October when you came with me!) Because of all of the chatter and social activity, I tend to use the retreat as a place for piecing things I can do without much concentration. I might machine quilt a project too. I think we are mostly agreed on the quilt title issue. We both agree that the title can richly enhance one's understanding of the quilt. 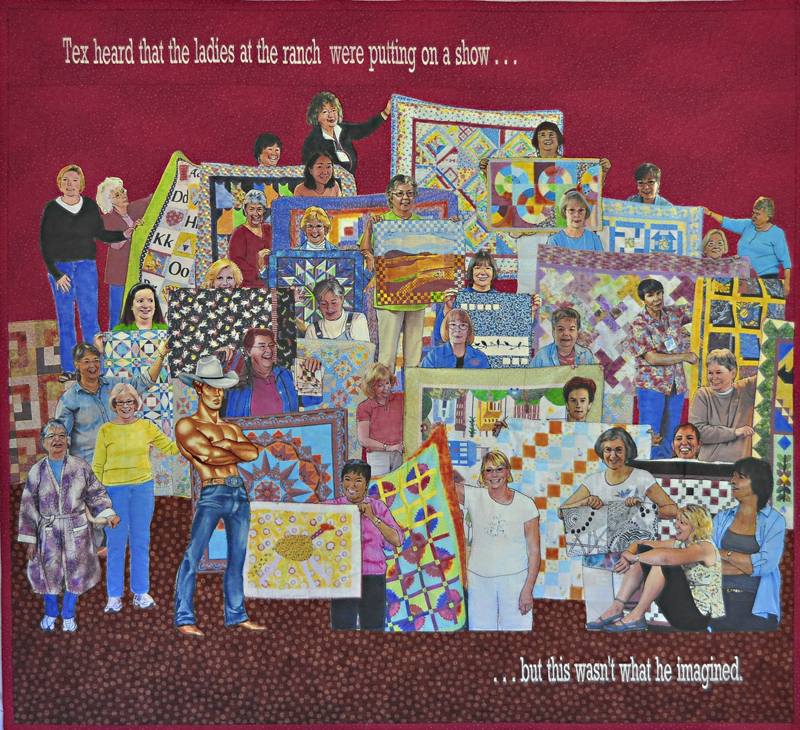 I've been thinking of your shock upon learning that at some art quilt competitions, the judges didn't know the title of the quilt when they judged it. My first reaction was that I thought it reasonable to judge the artwork on the imagery alone. The artist has chosen a visual medium, after all. Still, I also agree that the title conveys or at least adds to what the artist was communicating with the piece, and someone assessing the artwork should know that to assess it. I wonder what non-fiber art competitions do? It's probably handled differently at different venues, as in the quilt world. 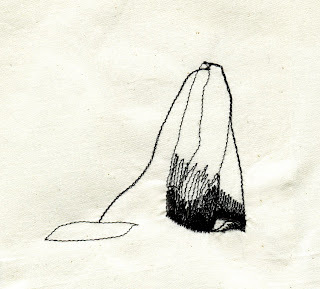 I like your story of finding the Marrakech postcard in your 2007 journal. That sounds like what journals SHOULD do, in whatever form they're kept -- provide sparks of inspiration by allowing you to stumbled onto things that you kept or jotted or sketched at another time. Like you, I'm bowled over by the beauty of some artist's journals ... but I know that putting that much work into a beautiful journal takes time and effort and of course looking at the journal itself as an artful process. I'm more like you, I think -- my journals are full of sketches and jottings but flipping through them does give me new ideas. One thing I started doing a while back -- if I sketched something that caught my eye or made a diagram of something that seemed noteworthy, I'd try to then make 4 or 5 more small thumbnail sketches morphing the design into something else. Distorting it. Changing shapes, Using an element differently. That sort of thing. And while I've not yet produced quilts from them, I like what's there and I get excited when I see them. Plus I think the practice at making 5 quick variations from one inspiration is bound to be good for my creative brain. My tea theme. I've been working this week on digital embroidery, stitching out the little sketch I digitized last week, then shifting it a bit to improve it, then trying a stitch-out again. I'm not sure why I now have a stitch-sketch of a tea bag ... other than I just am fascinated by teabags right now and I'm not sure where it will take me. Here is my first stitched out image -- which I posted on my individual blog, and got various reactions from folks saying everything from "obviously a teabag" to someone seeing a headless person wearing a sweater which I still can't find for the life of me. So perhaps it's not the best stitchy sketch but I'm learning and I must say that the process of taking my own image and turning it into automated stitches is rather fascinating. I have no photos but I also made a first experiment attaching teabag papers (beautifully stained with tea stains) to fabric with matte medium. Judy Coates Perez has done this to great effect in fiber art collages and I thought I'd give it a try. So far, I find the matte medium has darkened the fabric where it's been brushed, and looks sort of ... well... like wet parchment on fabric, maybe? I am trying to channel my inner Kemshall and remember that adding layers can change things dramatically. So once again I am struggling with the adventure/frustration of not knowing at all where I am going, experimenting with different materials and techniques, and seeing where it takes me. The drawing exercises continue and really, I'm finding that at this beginning stage it's still about learning what the pencil will do, how much value and texture you can get with a pencil. So that's fun. And, just to keep things exciting, I've signed up for Jane LaFazio's online Sketching and Watercolor class (via Joggles) which starts next week. I'm hoping that that will nicely complement the drawing lessons and inspire me to use watercolors and colored pencils a bit more regularly. And speaking of colored pencils, this week I was in an art/craft store and came upon a whole rack of Derwent drawing pencils. I felt like I'd stumbled onto old friends -- "I just visited your ancestors in your native land," I wanted to say. I am not doing the SAQA visioning thing. I can see how it might be useful for some and I can see how it's exactly the sort of goal-oriented thing you love. But for this week, I will be basking in the peaceful ranch atmosphere, chattering away with lively friends, and keeping my machine humming. It is supposed to be a drizzly week so that will make for a nice cozy retreat indeed. I will picture you and Dennis happily holed up in Bath, exploring Mr. B's Emporium and having a lovely afternoon tea! Have a scone (with jam and clotted cream please) for me, and I'll eat an extra corn-lime cookie in your honor! I think I found the sweater! It's an ombre one. The person wearing ii is facing to the left. The section to the right of the teabag center line is a sleeve. the other sleeve is partially delineated by the string, and the tag is perhaps a piece of paper the sweater-wearer is reaching out to. I'm not sure what has happened to the person;s legs, but they must be with his/her head. And if this is an iron there's some serious warpage on the sole plate!